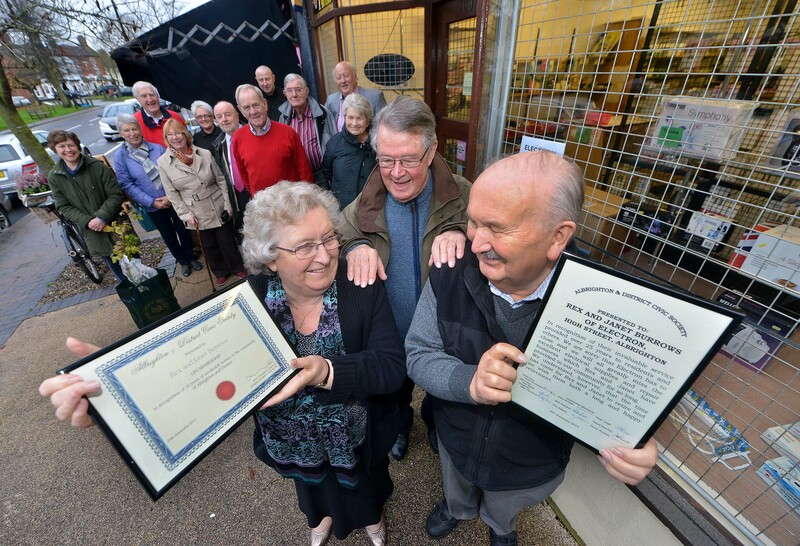 Rex and Janet Burrows have shut up their “Electron” electrical shop after 25 years business in Albrighton High Street. We have all benefitted from Rex’s advice on things from co-axial cables for TVs to fittings for plugs & sockets to problems with all variety of small electrical appliances and he always had time to talk to customers and to help them overcome all sorts of electrical issues. He was able to fix all sorts of appliances and repair televisions of all vintages and coaxed more life from them. He even repaired a guitar amplifier for my son. Many people have said that this is the one shop which we will all miss the most as there will not be another like it anywhere near here again. To celebrate the long service Rex and Janet have provided to the community of Albrighton the Civic Society marked the occasion by the presentation of Life Membership of the Society and a Plaque to thank them for the cheerful and unstinting service to the district. They were also given one of the special Albrighton Rambler Roses grown by David Austen Roses and Janet was given a bouquet of flowers. Rex and Janet have made the journey to and from Albrighton every working day from their home in Sedgley. They have three daughters and nine grandchildren and Rex only came to run the shop after a career in industry. Rex, 80, worked as a metallurgist researcher and was also working part time in the shop for 13 years before he bought the business in 1990 and made it the success that it was. It was the essential and place to go for advice and components for all things electrical.